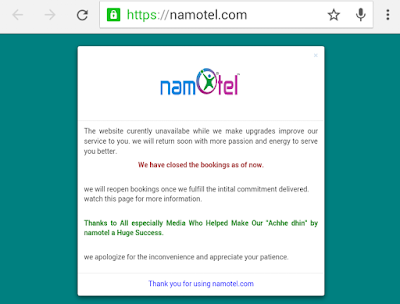 Namotel.com, the website named after Prime Minister Narenda Modi which had claimed to have begun booking Rs 99 smartphone, Namotel, appears to have suddenly gone phut. Reason? It wants to "improve" and "serve" consumers better! A visit to the website on Friday evening said, to quote word by word, "The website unavailable while we make upgrades improve (sic) our service to you. we will return with more passion and energy to serve you better." It further said, "We closed the bookings as of now. we will reopen bookings once fulfill the initial commitment delivered watch (sic) this page for more information." It continued, "Thanks to All especially Media Who Helped Make Our 'Acche Din by namotel a Huge Success." It added, "we apologize the inconvenience and appreciate your patience. Thank you for making namotel.com." The registration for buying the phone was originally planned from May 19 to May 25 on this website, but why have the booking has suddently stopped just one day later is not known. The man who owns the website, show details on http://who.is, is Madhava Reddy from Bangalore. 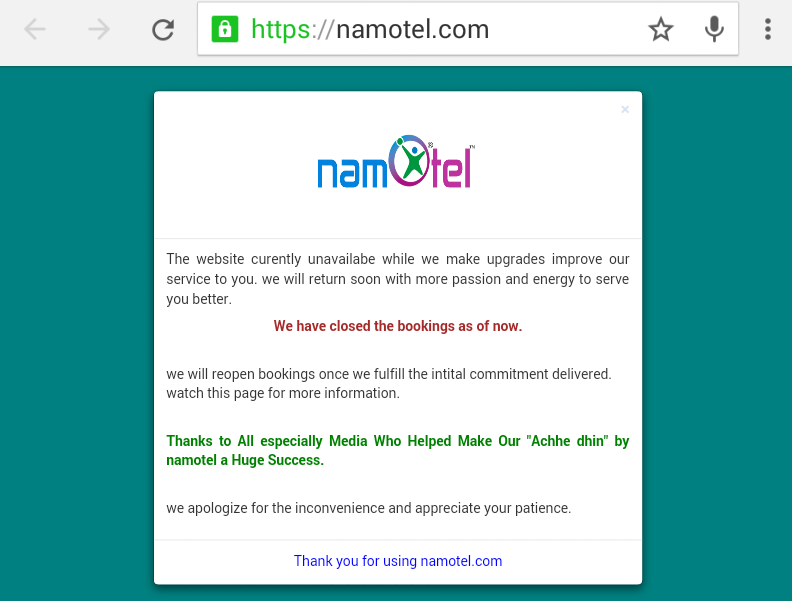 The site was "registered" on March 1, and "updated" on May 1, 2016.
nother website with a similar name, namotel.org.in, says, "This is Not Official Namotel Website. We are Not Collecting any People Information in the Form of Mail ids and Credit/ Debit Card Payment information. We are Only Promoting Product to the People, Not Gathering any Personal Information. For Checking/ Register go to Official Website : www.namotel.com." According to reports, the dual phone phone had offered basic specifications. It claims to run on 1.3 GHz quad core processor, with a RAM of 1 GB, internal storage of 4 GB, 3G connectivity support, and sporting a 2 MP rear and a 0.3 MP front camera. Run on on Android Lollipop 5.1.1, it was supposed to be available in two colours -- white and black. Madhav Reddy, says a report, had been the Namotel's only point of contact. His earlier worked as loan manager with Axis Bank. The promoter, according to this report, had earlier claimed that the phone was earlier priced at Rs 2,999, but was slashed to Rs 99 to usher in Acche Din. Namotel reportedly was to be available only to those who have aadhaar cards. Also in course of the online booking, which is not available now, Namotel was to charge an extra ₹199 to deliver the phone to the buyer's address. It was going to be the cheapest phone, so far offered in India. In February, there was Freedom 251, selling the smartphone for Rs 251. It failed to see light of the day. More recently there was Docoss X1 was announced, selling at Rs 888. In both the instances big promises to sell ultra-cheap smartphones were made, but nothing happened thereafter. A top news site said, "So, it would probably not be a bad idea to steer clear of these claims until there is some proof of actual intent to deliver on the promise of miraculously cheap smartphones."